While hiking in the snow one day, Dr. Lee Wickwire realized he was unable to lift his leg without enduring significant pain in his hips. He decided to see a chiropractor and found pain relief he’d never before experienced. “That chiropractic visit changed the direction of my life,” Dr. Wickwire acknowledged. Meanwhile, Dr. Zach Holst suffered from rib pain when he was around eight or nine years old. Not satisfied with the prognosis from their family medical doctor, his parents took him to see a chiropractor. “From just one adjustment, the pain went away, and I knew I could see myself becoming a chiropractor,” Dr. Holst affirmed. Through quality chiropractic and wellness services, Wickwire Chiropractic and Wellness Center has been enhancing the lives of Cedar Rapids residents since 2009. Before launching their new chiropractic website, we interviewed Drs. Wickwire and Holst to get a better feel for their aspirations. Both having experienced pain in their own lives, they have seen firsthand the power of chiropractic healthcare. Respecting their patients each in their own unique ways, Drs. Wickwire and Holst personalize chiropractic care and physiotherapy around their patients’ goals, educating and supporting them along the way. 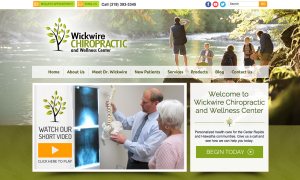 « New Chiropractic Websites Just Launched – Vital Life Chiropractic and more!